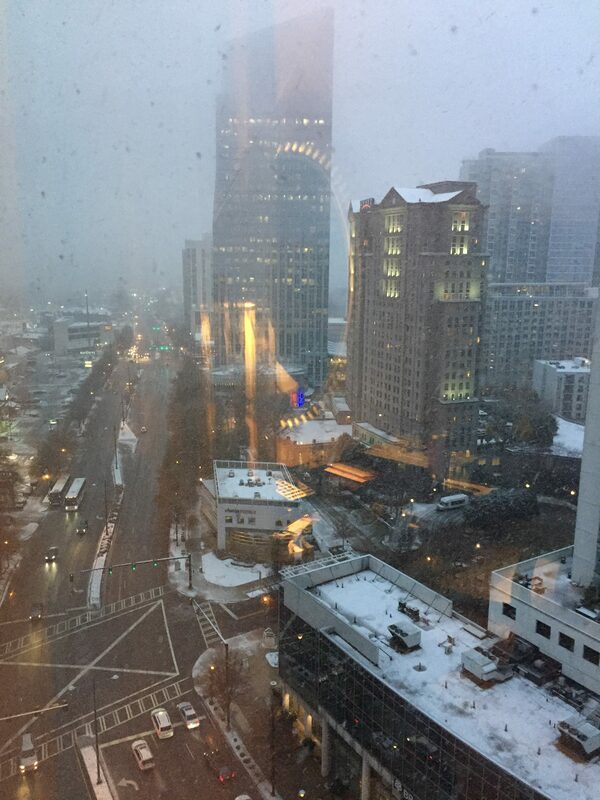 Attendees to the 2017 American Society of Hematology annual meeting in Atlanta this December were surprisingly greeted by snowfall. As a Southerner from Tennessee, I was eager to join Atlanta in extending our true Southern hospitality to tens of thousands converging on Atlanta this weekend for the 59th Annual American Society of Hematology (ASH) Meeting. Instead of our normal temperate weather in early December, ASH attendees were greeted with snow! Like many, I had no idea this was even in the forecast. It snowed much of the day on Friday and the temperatures are dropping. As I write this, we are still waiting to see how the ASH schedule and shuttles adjust when the meeting officially kicks off on Saturday morning. Fortunately, the snow didn’t deter an overflowing crowd of at least 1,000 physicians from attending Friday’s International Myeloma Foundation (IMF) Satellite Symposium: Getting Clear Answers to Complex Treatment Challenges in Multiple Myeloma. Education and sharing knowledge is the primary purpose that physicians come to ASH, and today’s forum was excellent start for all who attended. The symposium was moderated by Brian G.M. Durie, MD, IMF Co-Founder, Chairman, Professor of Medicine, Hematology/Oncology. He was joined by a panel of myeloma experts from around the globe. They joined together to help share their vast knowledge with the ballroom full of community oncologist/hematologists; all in an effort to provide better care for all myeloma patients. In an opening survey of attendees, 26% said they treated 10 or less myeloma patients per year, so they were eager to learn from the experts and to make sense of the ever-expanding myeloma treatment options. 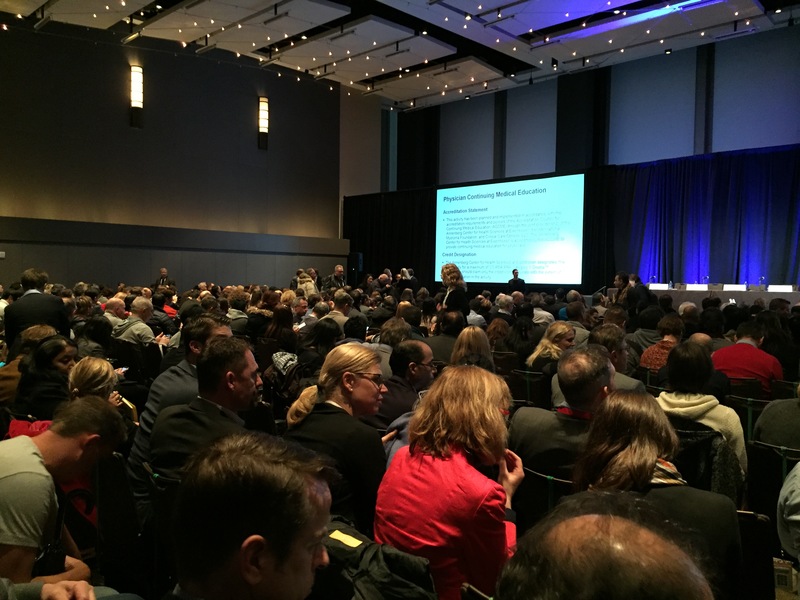 Nearly 1,000 medical professionals gathered at the IMF’s Satellite Symposium, preceding the 59th annual meeting of the American Society Hematology in Atlanta. The topics were framed around case studies including a patient’s age, diagnosis and previous treatments – providing a real-world perspective that the community doctors could relate to and take back to their daily practices. The case studies covered every stage in a myeloma patient’s journey from diagnosis, treatment selections, and relapse treatment options. Each topic was presented by one of the expert panelists, and at the conclusion, the treatment preference of each expert panelists was also revealed. They often all agreed, but not always, thus providing the community doctors with recommendations to consider, explore, and put into practice. The Satellite Symposium lasted about three hours and was full of fascinating information that was backed up by the latest clinical trials, some of which will be presented later this weekend. I encourage you to watch this valuable meeting; perhaps skipping to the section that discusses your current stage in the myeloma journey so that you get a first-hand perspective on what the experts are thinking. After viewing, your thoughts on it would be a great discussion to have with your local hematologists at your next appointment. Remember that informed and involved patients tend to have better outcomes! As they stress at the IMF, knowledge is power so be sure to take advantage of the many tools they provide.